Thousands of refugees are currently stranded in Greece. They are no longer splashed across the headlines, but split up into smaller groups and tucked out of sight in military camps. Many of these people have been through extremely traumatic experiences and, having made the difficult decision to risk their lives for the chance of safety in Europe, they are now faced with a lengthy wait – potentially over a year - in anonymous, degrading conditions. It is the complete lack of meaningful support, routine, information and occupation which now risks taking one of the biggest tolls on their health. Children out of school, lives on hold, and futures unknown. Our project started out very small – as friends who met volunteering and who decided to set up an educational project within one of the ‘relocation’ camps, and whose proposal was accepted inside the camp of Nea Kavala by both UNHCR and the military there. The camp is in the north of Greece, and is currently ‘home’ to an estimated 500 refugees, from mostly Syria, Iraq, and Afghanistan but also Palestine, Kuweit, Iran, Pakistan, Eritrea, and DRC among others. 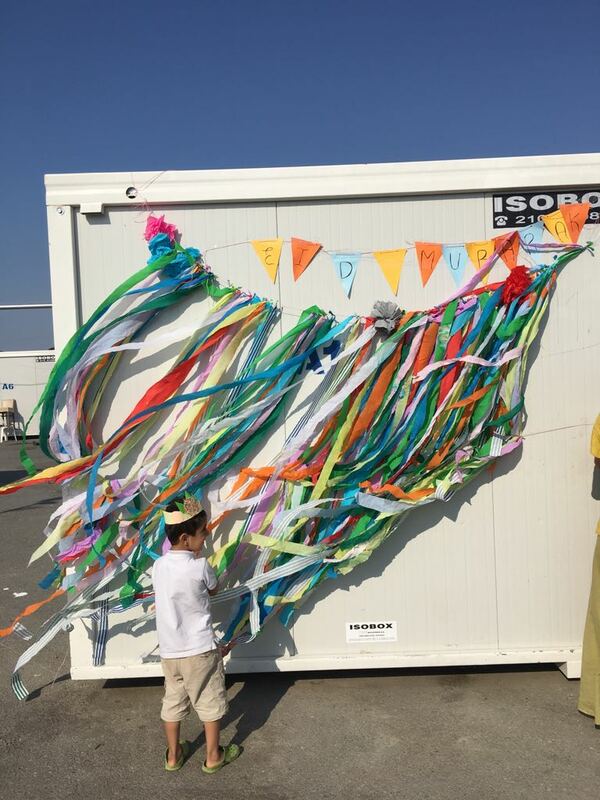 Approximately 25% of the population are children who, along with their families, are living in extremely close quarters in containers along the runway of an old airfield, with nothing to do while hoping and waiting out the long months for their asylum paperwork to be processed. Money donated to the We Are Here community centre project is divided between two pots. 75% of donations will go directly to funding material and projects for the centre – building materials to extend our space, photocopying, distributions, buying educational materials, art, textile and sports supplies, and buying basic need items or educational and creative resources for individuals in the camp when we see it is needed and helpful. 25% of donations will go to helping with the running costs of the project. Our team works for free and all volunteers who come to join us fund their own flights and food and make a monthly contribution towards the volunteer accommodation and running of the two project cars taking us to and from camp several times a day, but in order to put petrol in the cars and reduce the cost of accommodation to make this a viable project for people to stay longterm (which makes the project and our services so much better) we also need help from you! Children are pretty energetic in general, and the kids in Nea Kavala are no different! They love our sports activities, whether playing active games with simple equipment like sashes, cones and a ball, to more serious training in a sport like football, table tennis, ultimate frisbee etc with more professional gear. We Are Here needs your help to continue running our activities for children. Please donate and support us in funding our sports lessons for the coming months. The Women's Space has been a big part of many women's lives in the camp. In this safe environment, women of all ages come together to learn, be creative, exercise, cook, laugh, dance and escape from camp life for a few hours. As Nea Kavala is such a multicultural camp, we especially enjoy seeing women from different nationalities and cultures sharing food together. Preparing food and eating together is a great way to get to know another culture and bond. Please support We Are Here's Women's Space by donating, sharing and liking. 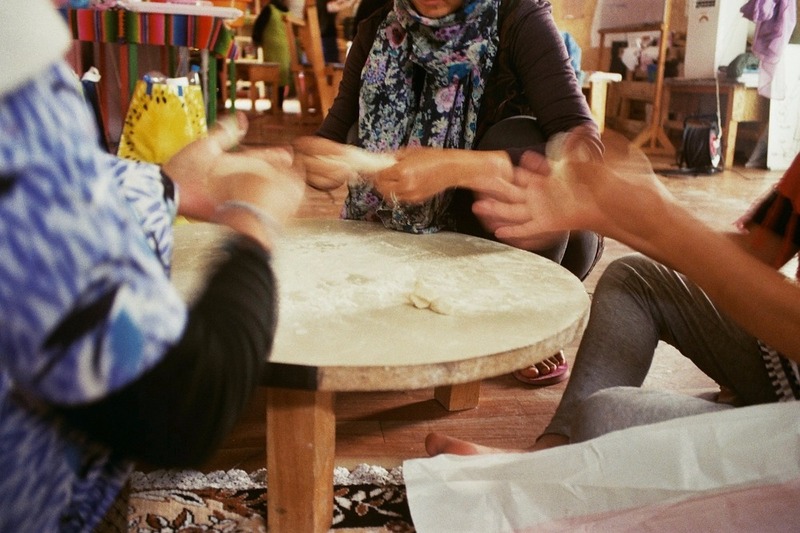 We Are Here has hosted a number of festivals and celebrations for refugees in Nea Kavala, and in nearby towns too. Traditional celebrations and holidays are a great way to keep in touch with one's own culture, as well as learn about European traditions. Whether it's Christmas or Eid, Easter or the Kurdish New Year, we love to have fun together and organise special activities. In this photo, one young boy enjoys the colourful decorations for Eid. At the end of Ramadan this year, we celebrated Eid together with the camp residents and Drop in the Ocean. There was lots of multicultural food, games and of course plenty of dancing. We love the cultural exchange and inclusiveness that festivals can offer. Please help We Are Here to continue hosting festivals like this one by donating, sharing and liking. One simple way We Are Here improves life in camp is by providing a few basics to help people help themselves. 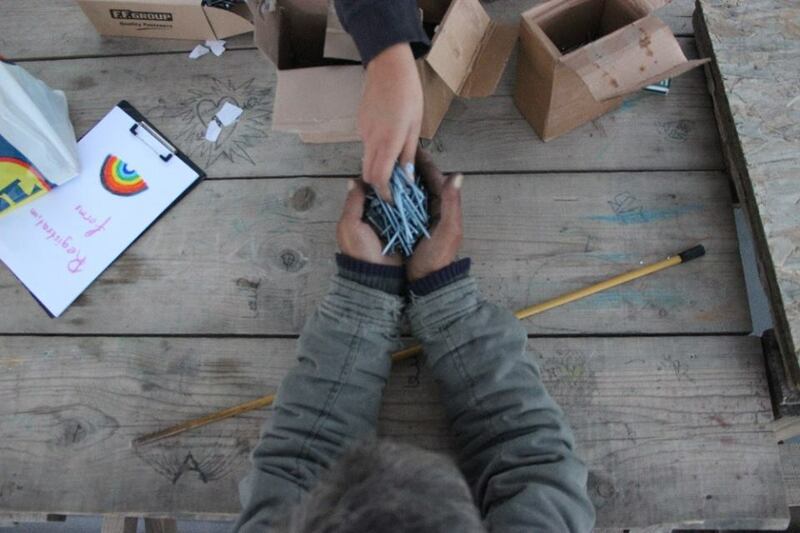 We lend tools and give out nails and screws to the residents. Living in a one-room container, this creates the option of porches, furniture, room dividers: more of a customised home. Wood has mostly been salvaged from the old tents' floors. Of course, over months of usage, some tools need to be replaced or upgraded, and a box of nails or screws doesn't last long in a large camp. Please donate to We Are Here so we can continue to support the refugees in their humble home improvements. And another donation following the WAH fundraiser on the Isle of Mull, Scotland. Some more donations from folk who were unable to get to our WAH big fundraiser on the Isle of Mull last week. This huge sum was raised by amazing supporters of We Are Here at a fundraiser in Fionnphort, Isle of Mull (the village where Chrissie is from). We are amazed to have raised so much in a small village of only 80 residents. A huge thank you for all the support received from everyone who donated so much in time, goods and money. The home-made cakes were delicious, the raffle & tombola were great and the music & entertainment were wonderful. On behalf of the Argyll Family Group of the Iona Community - wanting to help in even a small way, inspired by Chrissie's involvement and with thanks for the work of We Are Here.